I feel so virtuous when I eat beetroot as it is surely one of the healthiest foods out in town. These brightly coloured wee gems scream vitality and antioxidant goodness. In fact, beetroot gets its brilliant brightness from Betacyanin, a pigment which doubles as an antioxidant. Research has also shown that beetroot can help reduce blood pressure and associated risks such as heart attacks and strokes. This is due to their high concentration of nitrates, which produce a gas called nitric oxide in the blood, in turn widening the blood vessels and lowering blood pressure – what a star! Beetroot is also great if you’re making babies – it contains folic acid, which is essential for normal tissue growth and is crucial to the development of a baby’s spinal cord. Eating beetroot during the first three months of pregnancy can help prevent spinal cord defects such as spina bifida. Beetroot also contains iron so is a winner for those suffering from fatigue during pregnancy. This rustic salad tastes delicious, looks beautiful and is a textural sensation. 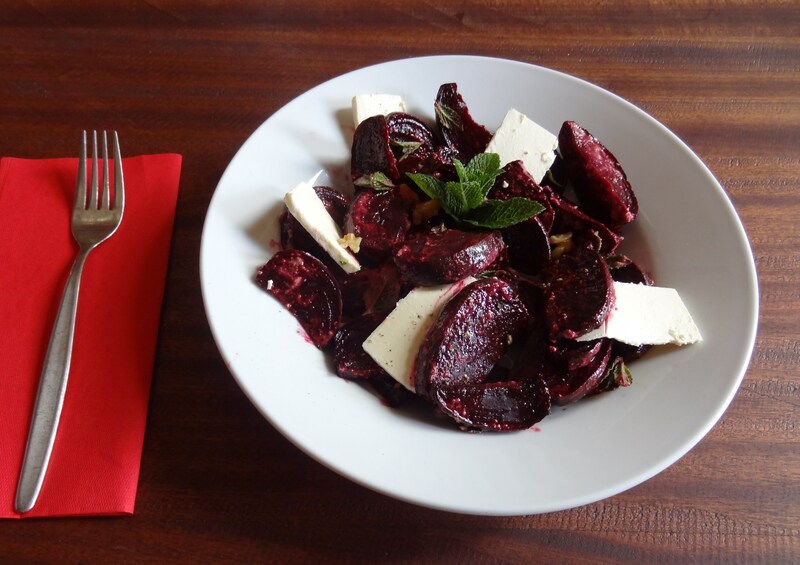 The sweetness of the beetroot contrasts brilliantly with the creaminess of the feta, and the tang of the orange and zing of the mint give the salad a delightful freshness. Sometimes I mix it up and add walnuts to the salad for an interesting twist. Recently I’ve also been using salt-reduced feta which has proven to be far superior to normal feta, which usually has a ridiculously high salt content in it – and certainly not the pink Himalayan rock salt which I love so dearly. Feel free to use any feta you please – (goat, sheep, cow) however, goat’s feta does work especially well with the beetroot. This dish is super easy to prepare and is sure to release your Inner Domestic God(dess). Heat oven to 190°C. Scrub the beetroot until they are clean and shiny. Trim off the ends and cut beetroot length ways into segments, about 1 – 2cm thick. Place in a roasting dish and toss with extra-virgin olive oil and Himalayan rock salt. Roast for 40-50 minutes, turning beetroot a couple of times, until beetroot have softened and caramelised. Allow to cool. Place all of the ingredients for the dressing in a jar, pop on the lid and shake, shake, shake. Finely slice or shave the feta length ways into pieces. Toss the beetroot and chopped mint (plus walnuts if you fancy) with the dressing. Arrange in a serving dish with the feta and garnish with mint. Salute! and discovered you’re using the exact same template as me. The only problem is on my blog, I’m struggling to get the design and style looking like yours. can get this figured out. By the way I’ve bookmarked your website: http://superfoodieadventure.com/2012/02/13/beetroot-feta-and-mint-salad-with-orange-and-tahini-dressing-2/ and will be visiting often. With thanks! I have been gone for a while, but returned on [date. It’s reminded me the reason why I loved this blog so much. Thank you, I will try and check back more frequently. . How often do you update your blog nowadays?